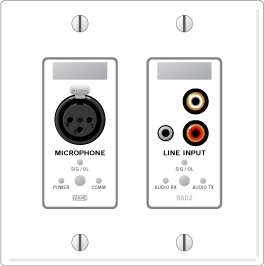 A RAD2 provides one professional quality microphone input on an XLR connector, and one consumer line input on 3.5 mm TRS and RCA connectors (all line inputs are summed together). 24 V phantom power can be activated for the microphone in software. A Euroblock connection on the back of the RAD allow hard-wiring to the mic input. The RAD2 mounts in a standard 2-gang US electrical box. It is available in white, ivory, or black, with a matched Decora™ plate cover included. Order model RAD2W for white, RAD2I for ivory, and RAD2B for black.